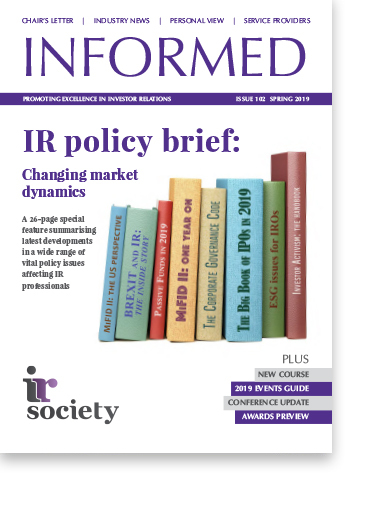 The Spring 2019 issue of Informed contains a special feature titled 'IR policy brief: Changing market dynamics'. We asked contributors to comment on a range of current issues for the IR community. Also in this issue, Richard Davies offers his thoughts on regulation and the current economic climate and Sallie Pilot writes about governance and stewardship and preparing for the IR Society Best Practice Awards. Regular features include industry news, the CEO's personal view, the chair's letter, new members, CIR passes, service providers and more. If you have any ideas for the inclusion in future issues of Informed please contact Laura Hayter.